Today’s treat is a book I will read again and again – because it’s the one that has many layers to it that I want to figure out. And also because I want to savor each sentence of each dialogue – so well composed they are. What starts as a military sci fi with a cyber touch – heck, no, it IS cyber sci fi in every sense of the word – crosses in the end a bit into fantasy, into the trickery of one’s own mind, a bit into a soft speculative setting, introvert and self-investigative. 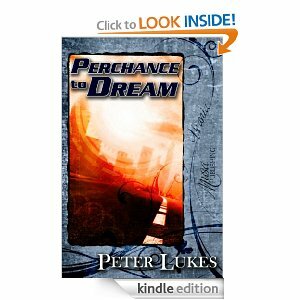 A military science fiction novel is only good when it has conspiracy and action it in – guess what, Perchance To Dream has both. Interesting fact is that people in the novel are very much us, so much it’s a little scary – it could be us in a matter of years, could be our brains tampered and our lives played with. Or, maybe, this is happening to us already? But who’s to say? A word needs to be said about the writer’s style. A clear cut, well articulated, the text runs smoothly without stagnation. Besides, the way this book is being presented and marketed tells me that author Peter Lukes is a long time player and he’s here to stay. Take him seriously and please, let’s ask him to write more!